Simply enter your text into the form above, then hover over the "Check Spelling" button and select the language that you want your text being checked as by clicking on it. This starts the spell checker and you'll see underlined words, which helps you to identify possible mistakes. When you click on these underlined sentence fragments or words you'll see a list of alternative variations of the word that you miss-spelled. You can choose a more appropriate word by clicking on it. If you want to take it further and check for grammar mistakes as well, click on the orange "Try now!" button on the banner underneath the editor. However, only English texts can be grammar-checked for now. If you spell-checked beforehand your changes won't be lost if you click it now. 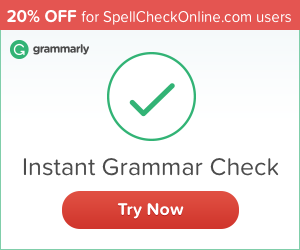 To find out how this online grammar check works, you can read more about it on GrammarCheck.net. Don't forget to bookmark this page! You might need to spell-check something again at some point. Don't you? You might also want to check out our free newsletter (using the form below), which offers entertaining news, and informs you about possible grammar rules changes well ahead in time! And, it's free as well!